Next is Techno Thriller Novel by Michael Crichton, This Novel is based on Genetic Technology and Genetic Research and it’s impact on the near future. The main theme of this books is Genetic and the ethical issues involved the use of genetics. This book doesn’t have the single plot, it has loads of sub plots. In every subplot author introduces some character, those characters has something to do with genetics. NeXt involves lots people from all the fields, like Scientist, Doctors, Lawyers, Teachers, Drivers, Guards, Kids and even Chimpanzees. In every plot author tried to show the impacts of genetic on the day to day life of a person, also in some plot he tried to show the advantages of genetics, like Growing artificial EAR, so that you don’t need a hearing machine. 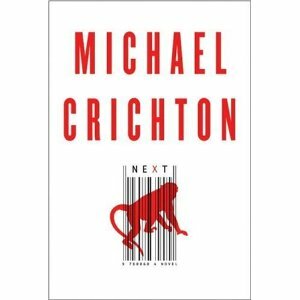 Crichton is well known as father of techno-thriller novels, either it is Jurassic Park, Lost World or Timeline, you never put them down once you start reading his novels, but this novel is not like all other novels may be because the lack of story line. While reading this novel, you will never feel like you are actually reading a novel, it is like reading a science book with many plots and example though some example given in this are hard to believe but still they will amaze you and don’t forgot he is the author who has given new life to the study of dinosaur after his ground breaking novel “Jurassic Park”. The author presented some very good ideas, also raised the concerns about the owner ship of genes in courts and chaos involved with the ownership. This book will explore lots of unknown origins of genetic science, if you don’t know anything about genetics or know very little then this book is must for you if you are interested in genetics and biotechnology, it will serve both as novels as well as science book for you :). “This novel is fiction, except for the parts that aren’t.” ~ Michael Crichton. Well, the story begins with Frank Burnet who contracted an aggressive form of leukemia and underwent treatment for four years, later he learns that checkups where setups for researching genetics basis of his cell which developed immune against leukemia. He later learns that his cells has been sold to BioGen, a biotechnology start up company which has taken patent on these cells. He then sues the university for selling the his cells without his knowledge and also sues BioGen for using his cell for commercial purpose. In parallel, BioGen is developing a “maturity” gene. which BioGen developing for the control of irresponsible and addictive behavior. BioGen researcher Josh Winkler accidentally expose this gene to his drug-addictive brother Adam who is cured in few day and leaves the drugs and show maturity. Some journalist discover some chimpanzees have been discovered which can speak french. A African grey parrot, Gerard, into which human genes were injected while he was a chick, can speak English and also mimic every sound. Gerard can solve the mathematics and he thinks he is a person not animal. Henry Kendall, a researcher some Bio-tech company finds that his introduction of human genes into chimpanzees a few years ago, has resulted in transgenic chimp who can talk and has lots of hairs on his body like chimps. Some artist uses genetic modification to change the appearance of animal, he changes the appearance of turtle which after genetic modification display the shining logo of Bio Technology company in night. Human genome has around 32K genes and chimpanzees only differ in 500 genes from humans. Author also states that 5% of our genes are already owned by some bio-tech companies. There are some plots in which a college girls sells her eggs for some bucks and there is one very interesting plot in which a doctor while in college donated his sperms to someone but after 20 years a girl appears claiming to be his daughter and accuses him fro her drug addiction and tells him that his whole family has the drug addiction gene which he transferred to her and she going to sue him for this. At the end author gives some reference to the books which from which you can read more about biotechnology and genetics and gene therapy.Overall a very good read if know little about bio-tech and genetics. I give it : 3.5/5. In the Nevada desert, an experiment has gone horribly wrong. A cloud of nanoparticles – micro-robots – has escaped from the laboratory. This cloud is self-sustaining and self-reproducing. It is intelligent and learns from experience. For all practical purposes, it is alive. As fresh as today’s headlines, Michael Crichton’s most compelling novel yet tells the story of a mechanical plague and the desperate efforts of a handful of scientists to stop it. Drawing on up-to-the-minute scientific fact, Prey takes us into the emerging realms of nanotechnology and artificial distributed intelligence in a story of breathtaking suspense. Prey is a novel you can’t put down. The novel is narrated by Jack Forman, who lost his job six month back. He is a Software Engineer was working at MediaTronics,heading a program division writing distributed processing software or agent based software, He is fired for attempting to expose an internal scandal in his company. He became a househusband, while his wife Julia is a vice-president of Xymos, a company specializing in high technology research, takes control of house. So far the relationship between Julia and Jack and Children were good, but suddenly Julia starts to behave weird, and her action becomes unpredictable, she starts to come very late, and even some time she doesn’t come to home. One day in a car accident Julia injures, she refuses to take MRI. Jack receives a call from his Ex-Employer, The program he wrote “PREDATOR-PREY” Agent Based Program, where multiple agents work together to accomplish a common goal, they sold it to Xymos is behaving weird, and they need his help to fix it. He accept offer not only because he is unemployed but also he wanted to find what his wife doing there at Xymos, He travels to Nevada desert center and what he finds there is beyond the night mares, a worst fear, where the nanobots designed to take picture by forming themselves as an human eye, each nanobot is very very small, which not visible to human eye, these nanobots are programmed using Agent-Based Program. This experiment has gone horribly wrong A cloud of nano-particles – micro-robots – has escaped from the laboratory. This cloud is self-sustaining and self-reproducing. It is intelligent and learns from experience. For all practical purposes, it is alive. Can Jack Succeed to stop them ? Michael Crichton is known as the Father of Techno-Thriller Novels,this book has written very cleverly, with lots of references at the end, so that one can read further about the topic. Michael Crichton has done plenty of research for writing this on nanotechnology and biotechnology. In summary a must read. I give it : 4.5/5.